Germany tumbled out of Euro 2004 after defeat to an under-strength Czech Republic team. Michael Ballack's stunning shot fired Germany ahead, before Marek Heinz levelled with a sublime free-kick. Bernd Schneider was the main culprit as Germany missed a series of chances in the second-half. And they were made to pay by substitute Milan Baros who took advantage as Germany pushed forward in search of a winner. This abject defeat marks the second European Championship in a row where Germany - who dominated the continental scene for so long - have been eliminated at the group stage. The luxury of having qualified for the quarter finals allowed the Czechs to make nine changes and rest key men such as Pavel Nedved, Jan Koller and Tomas Rosicky. But what was very much a Czech second string should have taken a third minute lead when Vratislav Lokvenc got a flick on Heinz's free-kick and Martin Jiranek failed to make contact from a yard out to Oliver Kahn's relief. 29 mins: Heinz peach of a free-kick levels. Despite their need for a win, Germany only played Kevin Kuranyi as an out-and-out striker and when Schneider swung in a cross he cut a lonely figure as Czech keeper Jaromir Blazek claimed. Germany looked distinctly one-dimensional going forward, with only Ballack lifting them out of the ordinary, and the Bayern midfielder saw his fierce shot loop up off David Rozenhal and over the bar with Blazek stranded. It was Ballack who fired Germany ahead on 21 minutes with a stunning goal. Schneider caught Jaroslav Plasil badly in possession deep in his own half and his cross was perfectly touched off by Bastian Schweinsteiger into the path of Ballack who screamed a left-foot shot into Blazek's top right corner. Germany still had little margin for error and they were rocked back on their heels when the Czechs drew level in spectacular fashion on 29 minutes. Heinz was brought down 22 yards out by Lahm and Heinz picked himself up to dip an exquisite free-kick over the German wall to beat Kahn's flailing dive. 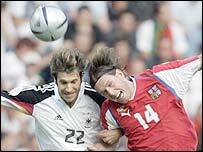 As half time approached, Germany still showed a marked lack of ambition, although Torsten Frings did spring forward to deliver a cross which Blazek just grabbed ahead of Kuranyi's lunge. Germany threw on teenage striker Lukas Podolski at the start of the second half but Czech substitute Tomas Hubschman made an instant impact with a cross which Lokvenc volleyed to draw a fine save from Kahn. But there was more purpose about Germany and Schneider drove forward to rasp in a shot which Blazek tipped over the bar. Ballack desperately tried to inspire Germany and he timed his run perfectly to connect with Lahm's cross only to plant his header straight at Blazek. Schweinsteiger then surged forward and laid a perfect pass into Schneider's path but as Germany at last got numbers into the box, the Bayer Leverkusen midfielder hit the first defender with his cross. As the traffic began to flow in one direction Schweinsteiger produced the goods from the right flank and Kuranyi just failed to make contact as he threw himself at the cross. On 66 minutes Germany should have taken the lead as Ballack's shot cannoned back off the post into the path of Schneider whose weak follow-up shot was clawed away by Blazek. Schneider then planted a free header over from six yards and in a frantic scramble Woerns' shot was cleared off the line by Hubschman and Podolski's follow-up was saved by Blazek. Germany's failure to take their chances returned to haunt them as they fell behind on 75 minutes. Czech substitute Baros took advantage of an under-manned German defence to brush off a thin challenge from Frings and although Kahn saved his first effort Baros reacted to poke home the loose ball. Germany: Kahn, Friedrich, Worns, Nowotny, Frings (Podolski 45), Hamann (Klose 79), Lahm, Schneider, Ballack, Schweinsteiger (Jeremies 86), Kuranyi. Subs Not Used: Lehmann, Hildebrand, Hinkel, Baumann, Bobic, Brdaric, Kehl, Ziege, Ernst. Czech Republic: Blazek, Jiranek, Bolf, Rozehnal, Mares, Galasek (Hubschman 45), Plasil (Poborsky 70), Tyce, Vachousek, Heinz, Lokvenc (Baros 59). Subs Not Used: Cech, Kinsky, Grygera, Jankulovski, Smicer, Koller, Rosicky, Nedved, Ujfalusi. Germany lost a European Championship match for the second time ever having taken the lead. The first was against Holland in 1988. The Germans have now not won any of their last six European Championship matches since beating the Czech Republic in the 1996 final, and have failed to negotiate the group phase in back to back European Championships. The Czech Republic had already won Group D before this match began, so they fielded a B-team which took their total for players used in this tournament to 21. After bringing on Tomás Hübschman, the Czechs equalled the Russians in using all their squad players except the third choice goalkeeper. The Czechs have won eight successive competitive matches which is one of the best ever streaks by a European nation. Their own personal best is an 11 competitive match winning sequences between December 1997 and October 1999. Marek Heinz scored from a direct free kick and was the second Czech player to achieve this at a European Championship. The first was Antonin Panenka, against Greece in 1980.